Invasion of plant tissues by pathogens is well known to activate localized reactive oxygen species (ROS) production and cell death. However, the sources of ROS production and their role in triggering cell death are enigmatic. A recent study by Dangol et al. (2018) shows that, in rice (Oryza sativa), immunity-associated ROS production and cell death are both dependent on iron as co-factor. Magnaporthe oryzae (rice blast fungus) is a hemibiotrophic fungal pathogen that causes major losses to rice harvests. Co-evolution of M. oryzae with rice has led to the development of diverse resistance (R) genes in rice that mediate the detection of diverse effector proteins produced by the fungus. In compatible interactions, in the absence of recognition by a resistance protein, the effectors suppress immune responses, including ROS production, and M. oryzae successfully invades rice cells. Dangol et al. (2018) investigated cellular responses in several rice–M. oryzae pairs with different compatibilities and identified a new player in R gene-mediated immunity, ferroptosis. This form of programmed cell death was described in mammalian cells just six years ago (Dixon et al. 2012) as a form of non-apoptotic iron-dependent cell death. It was discovered while investigating the effects of erastin, a compound that has many potential applications in medicine. In plants, iron homeostasis was shown to cover various roles in immunity (Aznar et al. 2015). Iron accumulation in wheat (Triticum aestivum) epidermis cells under attack by powdery mildew (Blumeria graminis f. sp. tritici) was also described previously, but without a link to cell death (Liu et al 2007). Dangol et al. 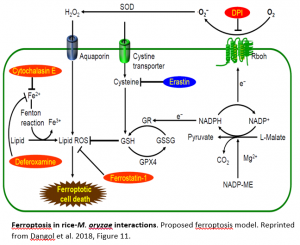 (2018) linked iron, ROS, and cell death and formalized the ferroptosis pathway in rice. 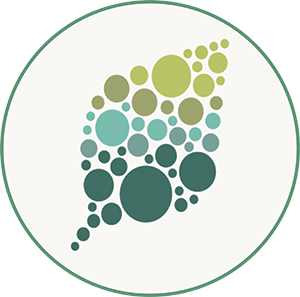 Future research on the role of this iron-dependent form of cell death will show how widespread ferroptosis is in plants. Rice–M. oryzae is the first plant pathosystem in which ferroptosis was detected. However, the accumulation of iron in response to powdery mildew was described in various monocots (Liu et al. 2007), suggesting that pathogen-induced ferroptosis is probably not restricted to rice. Aznar A, Chen NWG, Thomine S, Dellagi A. (2015) Immunity to plant pathogens and iron homeostasis. Plant Science 240: 90-97. Dixon SJ, Lemberg KM, Lamprecht MR, Skouta R, Zaitsev EM, Gleason CE, … and Stockwell BR. (2012). Ferroptosis: an iron-dependent form of nonapoptotic cell death. Cell 149: 1060-1072. Liu G, Greenshields DL, Sammynaiken R, Hirji RN, Selvaraj G, Wei Y. (2007). Targeted alterations in iron homeostasis underlie plant defense responses. Journal of Cell Science 120: 596-605.